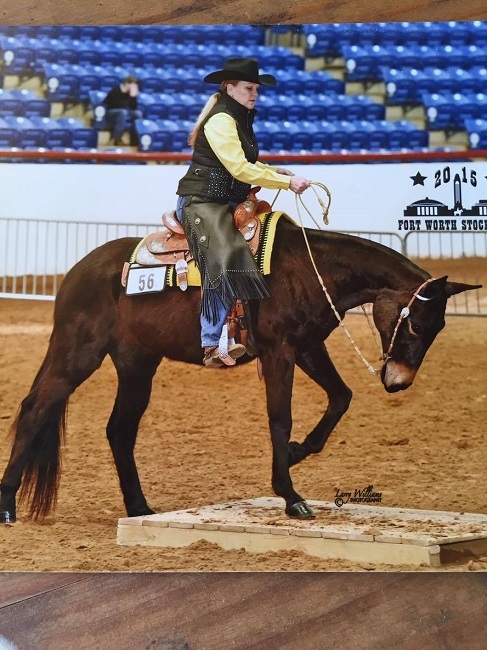 Another stunning mule from the US – and a champion, too! I saw her photo and just had to ask her owner, Kristin, for an interview. Recently, I attended a local ApHC UK show and was able to watch a trail class, which was fascinating for me as we don’t really see anything like that in British showing. Western showing is also more glamorous – I just love some of the outfits! – and, at the same time, more practical. Chinks and a bodywarmer seem to me to be a lot more comfortable and ready-for-work than cream jodphurs and stiff tweed jackets! It looks like a whole lot of fun. I can see why it would be easy to get hooked, particularly if you were partnered with a molly as lovely as Rumor. 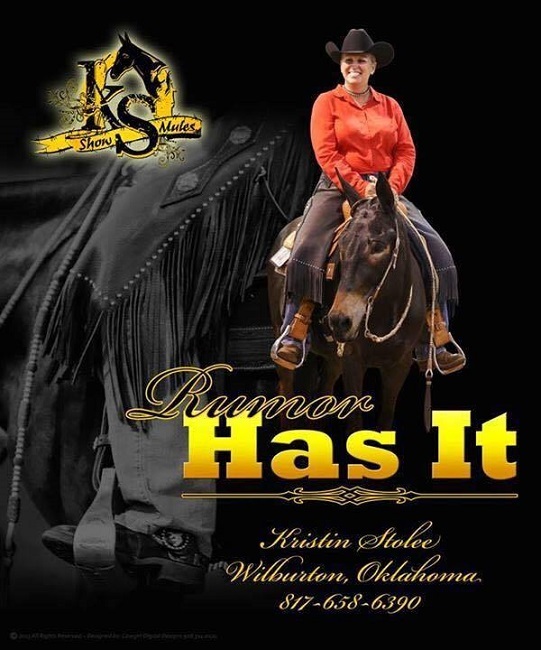 My name is Kristin Stolee, my beautiful mule is Rumor Has It. Rumor and I have a great relationship, she has some little quirks but that makes her Rumor! She is a character, she loves, loves, loves attention!! She is the first one to come to the gate, loves her bath and clip spa days too!! I met Rumor when she was a 3 year old, I fell in love with her, she had all the right moves. I had the privilege to work and show her as a three yr old. I lost touch with her until 4 years ago, she was for sale and I had to have her! 4. 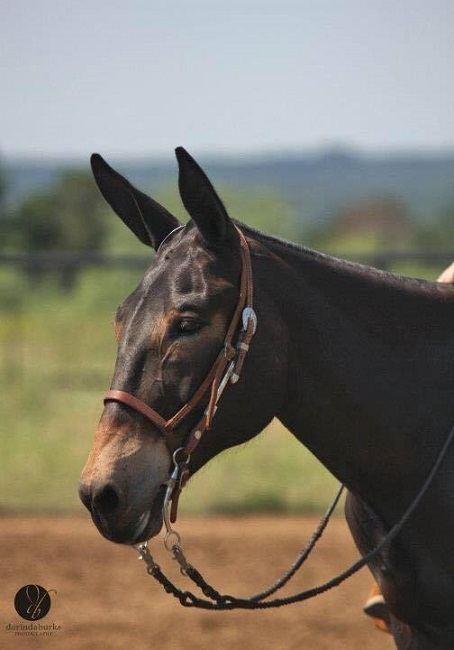 Can you share a story that you feel sums up your mule and/or your relationship with her? One of the proudest moments with Rumor was the day that she and I had the best Western Pleasure class in Denver! We worked and worked at getting everything consistent, relaxed and happy… I was feeling so excited about how our warm ups were going earlier that day and very excited about our class that night. Let me tell you, at the Denver show, Draft horses and mules use the same arena! Rumor was a rock star with everything that was going on, I was a little nervous! 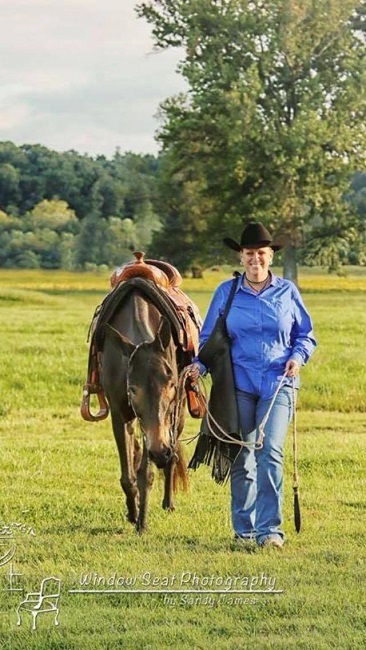 She went in that class…draft horses outside, stands full of watching fans…she nailed it!! We placed 3rd behind two top notch Western Pleasure mules!! I was so proud of her, I ended up in tears feeling like I won the world. We have not looked back and going strong!! I love that mule! 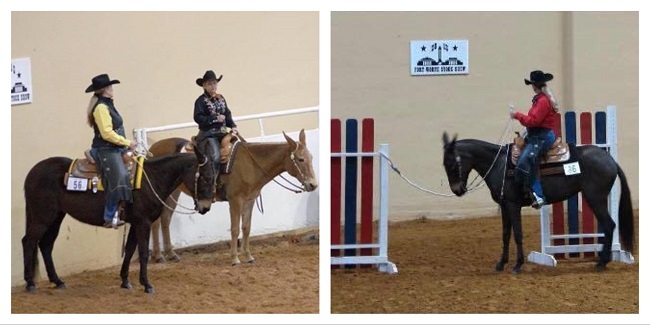 I was introduced to showing mules in 1991 and I have been hooked ever since!! I’ve learned a lot about the mules over the years. A big thing that works with the long ears is trust, they are a bonding animal. If they trust you, there isn’t anything they won’t do for you. Training mules you have to take your time to let them understand what you want, when they figure it out, they are eager to learn more. I add trail obstacles and trail riding to all of my training, it keeps them happy and learning!! If you would like your mule to be featured here, or if you have a mule story that you would like to tell, then please contact me either via this blog, message me on my Mulography Facebook page, or email me at: herecirm (at) gmail.com. I would particularly like to hear from UK mule owners (purely because Mulography is about owning a mule in the UK), but am more than happy to take worldwide submissions! Well it doesn’t look like a mule to me, she said.